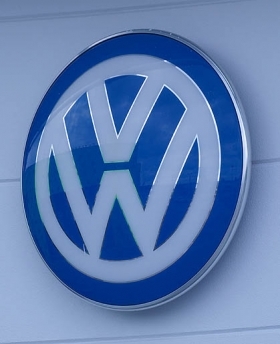 SHANGHAI -- Volkswagen AG aims to build electric vehicles in China from 2013 to cater to demand for models that are less polluting, Karl-Thomas Neumann, the head of Volkswagen China said. VW could build two electric models with venture partners in China, he said. The models may have a range of 100 kilometers (62 miles) to 200 kilometers, he added. VW produces cars and SUVs in China through ventures with SAIC Motor Corp. and China FAW Group Corp. The two ventures have each created a prototype EV and will introduce test fleets next year, said Neumann. Governments in China and Europe are getting "more realistic that electric cars could quickly replace internal-combustion engines," Neumann, who is CEO and President of VW's China unit, told reporters during a visit to the Guangzhou auto show on Monday. VW aims to have 10,000 EVs in the country by 2018, he said. "It's not clear what the rules will be around the electric car," he said. "That's one thing I'm asking for, that we get clear guidance from the government." Volkswagen is counting on China to help it surpass General Motors Co. and Toyota Motor Corp. as the world's biggest automaker by 2018. In 2010, VW group sold 7.14 million units, behind GM with 8.39 million and Toyota with 8.42 million. VW is spending 10.6 billion euros ($14 billion) through 2015 to expand in the nation it first entered three decades ago, as part of a push to increase sales in emerging markets. Neumann reiterated VW's plans to double production capacity in China by 2015. The carmaker sold 1.9 million vehicles in the first 10 months in China, an increase of 15 percent from a year earlier, it said on Nov. 11. The automaker is targeting sales of more than two million cars in China this year and expects its growth to be faster than the industry's pace in coming years in the world's largest car market, Neumann said. China's total automobile demand may grow less than 2 percent this year, while passenger-car deliveries may increase 9.4 percent, Neumann said. VW's China chief is "very optimistic in the medium term" on car demand given the low rate of ownership in the country, he said. The China Association of Automobile Manufacturers has projected nationwide vehicle sales to grow less than 5 percent this year, slowing from last year's 32 percent gain, the removal of government purchase incentives hurt demand. VW also markets the Audi, Skoda and Bentley brands in China, the world's largest auto market. It will introduce the Seat brand at the Guangzhou show.